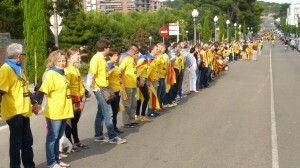 Supporters of independence, 2012. Photo by Pere prlpz. Source: Wikipedia Commons. On November 9, 2014, hundreds of thousands of Catalans, perhaps millions, will print their own unofficial ballots and head to improvised polling stations to cast a vote for independence that nobody else but them will consider valid. Most Catalans opposed to independence will stay at home and lament growing political polarization. The result will be a resolute vote in favour of independence. The Spanish government opposes a vote and argues that the best way to defend democratic rights and freedoms is to abide by the provisions of the 1978 Constitution. This Constitution, as a compromised product of the Transition to democracy, aimed at creating stability and thus requires absolute majority in the Spanish parliament to reform it. Even if all Catalan politicians were in favour of it, and they are not, they would never have enough parliamentary support to do it. Pro-independence politicians and activists conveniently forget that all four Catalan provinces approved with high percentages of the popular vote the 1978 Constitution in a referendum and argue that democracy today demands acknowledging the right to self-determination for Catalonia, something completely outside of the scope of the Spanish constitution. They use the Spanish government’s immobility as a sign that Spain is today, as it has been for the last 300 years in their nationalist view, all about control by force and claim they are the only ones fighting for democratic rights and freedoms. Catalan nationalism prides itself as a historically rooted, culturally vibrant, progressive movement. It mirrors itself in the post-1989 path towards independence of the Baltic countries, the Czech Republic, and Slovakia: all new European countries that were able to transition peacefully towards national independence and membership in the European Union. Since Catalan nationalists only embrace peaceful means, very few references are made to the bloody break-up of Yugoslavia. But perhaps the experience of small European countries created shortly after World War One could be more relevant for the Catalan experiment. One striking similarity calls for attention. As Mark Mazower writes in Dark Continent: Europe’s Twentieth Century, “Versailles had given sixty million people a state of their own, but it turned another twenty-five million into minorities” (42). Similarly, independence for Catalonia would give 7.5 million people a state of their own, but would turn 4.6 million people into minorities. The bulk of the population in Catalonia are ethnic Catalans and the nationalists among them consider themselves a nation without a state in its road towards freedom from Spain. The second largest group are ethnic Spaniards who migrated to Catalonia for economic reasons throughout the 20th century from other regions of Spain. Ethnic Spaniards and especially their descendants, who between 1950s and 1980s were derogatorily called xarnegos (mixed-birth, applied to children of mixed ethnic Catalan and Spanish couples and to non-Catalan speakers), have learned Catalan and many identify with Catalonia, but a significant number remain Spanish speakers. Ethnic minorities in Catalonia, almost 16 percent of the population in 2012, are the product of international migration in the last 40 years. They are predominantly Spanish speakers from Latin America, Muslims from North African and Pakistan, and Eastern Europeans from Romania. The discourse and government practices of Catalan nationalists since 1979 reveals the ethnic features of the Catalan nationalist project. 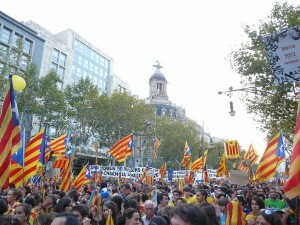 Similar to sovereigntists’ demands for laws such as Bill 101 guaranteeing the survival and hegemony of French over English in Quebec, Catalan nationalists are suspicious of the large Spanish-speaking group in Catalonia and perceive it as an obstacle for the Catalan cultural hegemony they envisage. Having Catalan as the main language of primary education, something pro-Spain Catalan politicians and the current conservative Spanish government opposed and Spanish courts recently turned down, is only a first step towards desired Catalan language hegemony in the public sphere. The most radical side of Catalan nationalism perceives Spanish speakers as “colonists” sent by Dictator Francisco Franco (1939-1975) and democratic Spanish governments to weaken and eventually trigger the disappearance of the Catalan nation. Most moderate Catalan nationalists acknowledge that bilingualism is a reality in Catalonia, but nevertheless believe it should not be so. In their view, bilingualism will entail a slow death for the Catalan language, as Spanish is the language of choice for many Catalans. Strategically, the most prominent Catalan nationalists have declared that Spanish would remain as an official language in independent Catalonia. But this is doubtful because for many Catalan nationalists, culture is a zero-sum-game and independence is the only way to guarantee the survival of the Catalan language and culture. Ethnic and religious minorities are being courted by nationalists with publicly-funded institutes, such as the New Catalans Foundation, as well as promises that independence will improve their lives. Unfortunately, there is no indication in the policies of Catalan nationalist parties that an independent Catalonia would be more welcoming to immigrants and would grant them easier access to work and residency permits than Spain currently does. Moreover, Catalan governments have been more reluctant to grant religious and cultural rights to Muslims than other regions of Spain. Despite Muslims being 6 percent of the population, Barcelona – the largest city in Catalonia – does not have a Great Mosque (Madrid and Valencia do) and is one of the last three European cities without one (the other two are Athens and Ljubljana) (See “Barcelona and The Mosque that was Never Built”). The Catalan government has also been reluctant to implement the 1992 Agreement of Cooperation signed between the Islamic Community of Spain and the Spanish Government, including its provision that mandates regional educational ministries to offer optional classes of Islam in public schools when enough parents demand them. Post-independence Catalonia is unlikely to welcome immigrants unless they are “assimilable” (visible minorities tend not to be included in this category) and willing to culturally assimilate, as the former president of the Catalan government often explained. Historian Eric Hobsbawm concluded his Nations and Nationalism since 1780 by arguing that “xenophobia has become the most widespread mass ideology in the world” (170) and despite efforts by some Catalan nationalists to defend immigrant rights and welcome them, Catalonia has been the first region of Spain to witness the emergence of an Islamophobic identity party that reached 75,000 votes in 2010. Once the main enemy (read Spain) is out of the picture, the false unity created by the fight for independence will collapse and the paradisiacal society nationalists envision – wealthy, democratic, and European – may turn out to be no more than another provincial ethnic nationalist project in which minorities and fluid identities become targets once again. Aitana Guia is Sessional Assistant Professor in Modern European History at York University, Toronto, Canada. Her latest book is The Muslim Struggle for Civil Rights: Promoting Democracy through Migrant Engagement, 1985-2010 (Sussex Academic Press, 2014).